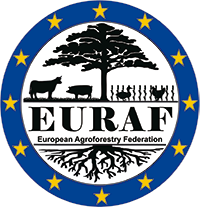 The European Agroforestry Federation (EURAF) aims at promoting the use of trees on farms as well as any kind of silvopastoralism throughout the different environmental regions of Europe. EURAF has about 285 members from 20 different European countries. Agroforestry is the integration of woody vegetation, crops and/or livestock on the same area of land. Trees can be inside parcels or on the boundaries (hedges). Agroforestry can be applied to all agricultural systems, in all parts of Europe. Agroforestry systems are obtained by planting trees on agricultural land or introducing agriculture in existing woodland/orchards (e.g., silvopasture). Europe has a unique heritage of traditional agroforestry systems with a high environmental and cultural value, and Europe has a high potential for innovative modern agroforestry systems developed by research centers across Europe during the last two decades. Agroforestry practices have been overlooked by previous CAP schemes, resulting in billions of trees being destroyed across Europe. Recently, incentives for establishing AF plots have been introduced, but conflicts between pillar 1 and pillar 2 rules have prevented European farmers to establish or maintain agroforestry systems. Agroforestry is a beneficial system leading to a low carbon and high biomass productive agriculture. It provides many ecosystem services while maintaining high productivity for the farmer. It is a win-win option for farmers and conservationists. Specific ecosystem services include carbon lock up, flood mitigation, reduction of diffuse pollution and soil erosion, protection of crops and livestock against climatic hazards due to climate change, synergetic production of crops and tree products, integrated habitat network and high biodiversity value, optimized crop protection due to self-regulation of pests and diseases in mosaic environments, landscape amenities supporting tourism and wild game.